A basic reality of any and all group exercise programs is that people are going to be working semi-autonomously for large portions of class. Often times, you'll come across individuals who need way more help than the average person—the kind of people that make you think, "Oh boy, can you do the exact opposite of all that??" If you plan on doing any group coaching, whether CrossFit or otherwise, you're going to deal with these people on a daily basis. And you, as the empathetic coach, may not be quite sure how to deal with troubled movers while also not ignoring the rest of the class. You need to learn some skills that enable you to triage these people so that they can remain safe and informed about how to handle themselves while you’re not there. In today's article, we're going to share some strategies and examples of how to work with people who need more than basic cues and corrections. When Earl L. began Strength Cycle at CFSBK in the early spring of 2012, he weighed 175 pounds and had been CrossFitting for three years—but knew he needed to get stronger. He already worked as a private military contractor, but decided to treat the program like another job, rather than just “going to the gym,” which meant he began eating more (viewing steak as a staple), quit drinking, and slept as often as possible. Within eight weeks, he took his totals from 275 on squat, 125 on press, and 335 on deadlift to 355, 165, and 405 (respectively). He also gained 23 pounds without altering his body composition. Earl’s story is a powerful example of the efficacy of Strength Cycle, and demonstrates why we stand behind this program so strongly. Last week, we discussed the origin and basic overview of Strength Cycle program run by coach Jeremy Fisher. If you missed that article, please check it out to gain a more context before digging into the logistics of how to run the program, which we’re sharing this week. As we’ve mentioned on Inside the Affiliate before, coaching skill is only a small part of what it takes to run an affiliate, and there are countless other qualities that are required to excel in this business. For starters: the ability to manage people, make tough or sometimes unpopular decisions, listen to your instincts, and the humility to know that you won't always be right. Two weeks ago, we talked about how to start a great gym. 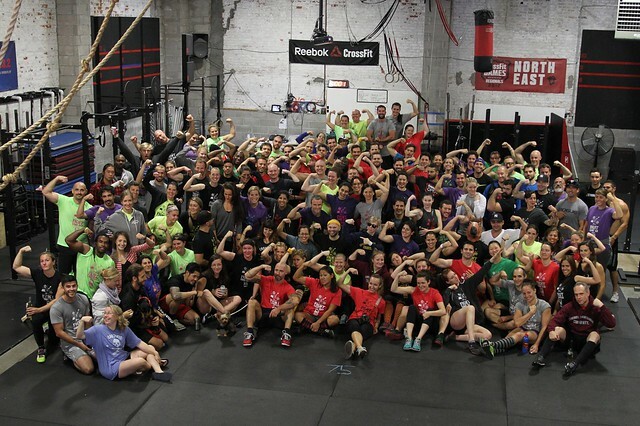 This week, I’m sharing 5 things I’ve learned since starting CrossFit South Brooklyn and growing it into a thriving affiliate. Hey everyone! This is just a quick note to say I'm going to be in Carson for the 2014 CrossFit Games this year. This is my first time back to spectate the Games since 2009 in Aromas, so I'm pretty excited to see how much it's evolved in only a few years. On that note, if you see me, please don't hesitate to come over and say hi! I'd love to talk shop and meet anyone and everyone who reads the blog. One of the best things I've experienced since starting ITA is all the great conversations I've had with other coaches and owners about running an affiliate, programming, and everything under the CrossFit sun. So again, please don't be a stranger! When I decided to start CrossFit South Brooklyn, there wasn’t another CrossFit gym within the 97 square mile span of Brooklyn. Now, if you want to affiliate, it’s more likely than not that there are already other gyms in your area, since we just hit 10,000 affiliates around the world. The ubiquity of CrossFit provides you with a number of examples that can inform what you do or don’t want your gym to look like. It also means that the number of resources to help you along the way is increasing exponentially, this blog being one of them! Plenty of those resources break down the costs of affiliating, and I will certainly address those. But this article will be a response to the questions I’ve historically gotten from people who are interested in starting a gym. Choosing the right CrossFit gym can be a major decision in your life. A bad experience can taint your perceptions about CrossFit as a whole and discourage you from finding a box that suits your needs and interests. In CFSBK’s weekly Teaser classes, I always tell people that they should be informed consumers and shop around at different gyms before signing up. I do this for two reasons: first, as a sign of good will toward the other local affiliates, and second, because I'm confident enough in our program that I don't feel the need to horde potential members. If our Teaser participants like our vibe, they'll sign up; if not, maybe a different affiliate is better suited for what they want. But as a consumer, what should you be looking for in a gym? I’ve been involved in the fitness industry for over a decade and I'm consistently shocked by the lack of research or expectations consumers have before signing up for fitness programs. Below, I've outlined a few things that I recommend people keep in mind when shopping around for a CrossFit affiliate. If you're already happily training at an affiliate, we hope you'll send this to friends and family considering starting CrossFit in a different region. Growing up, I hated team sports. I didn’t like being responsible for the outcomes of other peoples’ experiences, and I didn’t like other people being responsible for mine. This disposition was part of why I wanted to become a coach, have my own business, and do it without partners. I loved that every class and aspect of the gym came out of my own expectations and intuitions. But as our gym got bigger, one of the skills I had to acquire was being a better team player. Most CrossFit coaches have pretty strong personalities, which can lead to wanting to control everything—especially when it comes to running a group class. Working with people isn’t always intuitive, and requires practice and clear expectations about each person’s role. Continuing on in ITA’s series about CrossFit group class coaching expectations, I’ve outlined basic guidelines that allow my coaches to focus on working as a team, and not be sidetracked by logistics while running classes. There aren’t assistant coaches or interns at CFSBK, and everyone has an equal share of work. We ensure that there is transparency and balance between who does what, which goes a long way in avoiding disputes or ambiguity regarding roles and duties. This also provides good guidelines for feedback if there is an imbalance in how coaches are working a class together. CrossFit founder and CEO Greg Glassman once said: “I can tell you what it is that makes you successful in business, more specifically as a CrossFit affiliate. It’s the blind and relentless constant pursuit of excellence.” On ITA, we never get tired of talking about what we think makes an excellent CrossFit coach. Last year, I wrote about how as an affiliate owner, your coaches are the most important resource you can leverage—they are the brick and mortar of what will make your business solid. Earlier this year, I wrote an open letter to new coaches, emphasizing a few basic principles for getting started on one’s career. And a few months ago, ITA profiled one of CFSBK’s coaches, who shared 10 pieces of advice for other coaches. Today, we’re continuing on in our series about the concrete expectations I have for CFSBK’s coaching staff during group classes, and these six categories below cover all the behaviors—specific to the unique, complex art of coaching—that I believe every professional CrossFit coach should embody during classes. Each of these categories reflects CFSBK’s own constant pursuit of excellence, and hopefully there will be plenty of crossover for your situation as a coach or affiliate owner. In last week’s article, I wrote about a brainstorming session a few years ago that led me to identify my expectations for my coaches during group classes. I wanted those expectations written in concrete terms so I could communicate with my staff more clearly and get all of us on the same page. As I stated before, I believe there are underlying principles of coaching that are consistent regardless of coaching style, personality, or context, and I now have a basic document that functions as a "job description” for my coaches. Last week, we talked about the importance of timeliness, and today, we’re going to address effective communication. When I first started teaching group classes after years of training clients one-on-one, I quickly realized that communicating with a class was an entirely different skill that I needed to acquire and develop. Working with groups necessitates clear and effective public speaking skills. Your success coaching at or owning an affiliate is largely predicated on your ability to communicate with groups to accomplish the training goals of a class in a way that engages every member.